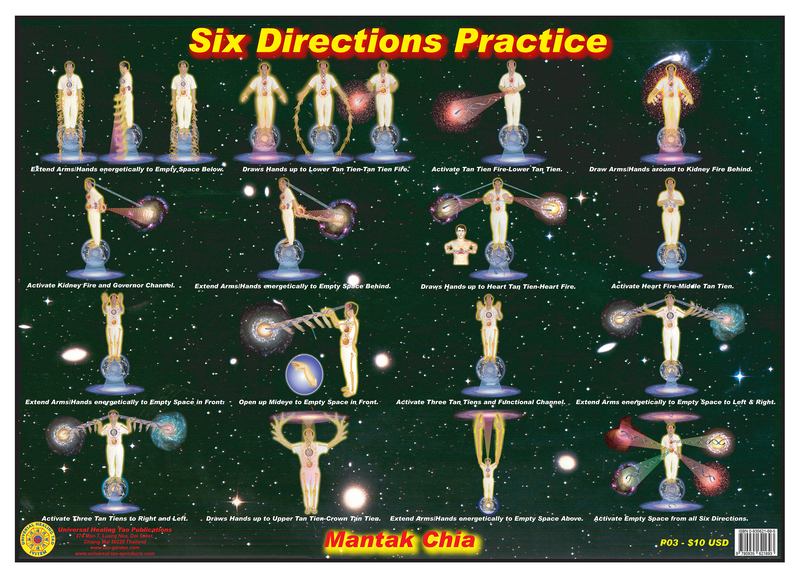 This poster illustrates Hand Techniques to draw up the energy to the Lower Tan Tien activating the Tan Tien Fire, Heart Fire and Kidney Fire extending the Hands Below, Front, Back, Right, Left and Above activating the Empty Forces in the Universe from all Six Directions. Smile down shoulders and draw palms into ground. Lift index fingers up to empty space below the earth and draw the earth energy up. Move arms and palms in front of Lower Tan Tien connecting to Tan Tien Fire. Smile to fire burning and feel warmth spread. Move hands to Ming Men (Kidney Fire) burning up to brain. Turn Palms out and smile to empty space behind drawing energy back into Kidney Fire and Govenoring Channel. Lift palms up under armpits and extend fingers into chest to Heart Fire. Palms in front then hook fingers to open Mideyebrow. Turn palms out and smile to empty space in front then move arms forward drawing back to Functional Channel. Move palms out to sides sending smiling energy to left and right horizons. Move arms in and out drawing energy in. Lift palms up above crown then turn body left to right (3 times) and reverse gathering energy above. Draw legs together and draw fingers to Crown Point connecting with perineum. Move fingers to Mideyebrow then connect jade pillow, to ears, to skull base and back opening Upper Tan Tien (Crown). Move fingers down nose to upper lip and draw tongue to palate. Press tongue up then fingers to throat. Connect with C-7 to Middle Tan Tien (Heart) to Wing Pt. and reverse. Open palms to solar plexus connecting with T-11 forming Mini-Sun with Sun radiating sunlight into organs. Move fingers to navel connecting with Ming Men, to sides, to Ming Men then back opening Lower Tan Tien (Navel). Move fingers to thigh bones penetrating to feet and squat down upright. Rest hands on feet then straighten legs (3 times). Stand up drawing fingers to sacrum to sexual palace then push hips out, Open Microcosmic Orbit from Ming Men to Navel; T-11 to Solar Plexus; Hands over Head to T-5 (Heart), C7 (Throat), Jade Pillow/Mideyebrow and Crown/Perineum (Governor Channel). Open legs with palms at sides and feel buoyant and being at Center of the Universe. Draw legs together and collect energy at navel.